Caries (which comes from Latin, meaning "dry rot") is the term for the slow disintegration of "biologic hard tissue" due to bacterial action. By stating "biologic hard tissue" as the victim, caries can actually happen in bones. If it specifically involves the tooth, it is proper to termed it dental caries, or what we normally call tooth decay. Now, taking aside a large cave-in on your tooth, which is so obvious so as not to mistaken it as other things than a tooth decay, have you ever wondered what is that black line running through the grooves of your molar teeth? Or perhaps, even a chalky white spot on a tooth surface, that no matter how you remove it with everything you have in hand, it still lingers there? developed a tooth decay in its early stage. Fig.1-1. A primary set of dentition showing various forms of caries at different stages. Fig.1-2. Pit and fissure caries extending to the buccal groove. Fig.1-3. 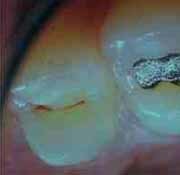 Pit and Fissure caries. (c) University of Sheffield Fig.1-5. A large proximal caries. apt to be done. The carious portion of the tooth is burred out and a permanent filling is placed on the cavity.